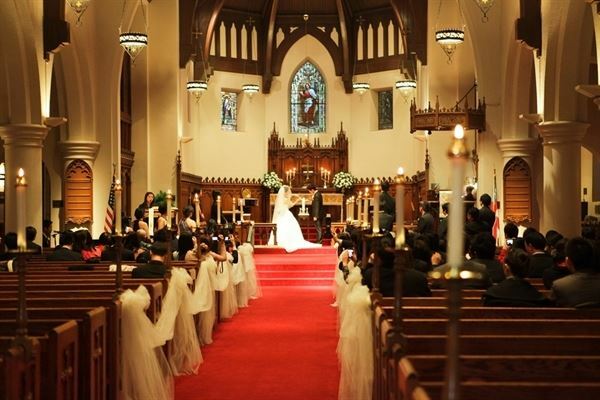 If you elect to have your wedding at The Church of Our Saviour, it is hoped that it will be one of the most joyous occasions in the lives of not only the couple getting married, but of everyone there. By the time this wonderful day arrives, many people will have been involved in assuring the success of this joyous event. Some of the people within the church who will do everything possible to make this a blessed and happy event are: the priest who will counsel and officiate in accordance with Canon Law of the Episcopal Church; the Altar Guild who prepares the church for the wedding, being sure that the candles, flowers, vestments, books and other necessary items are in order; the music department who will coordinate and play the music at your wedding; the lay readers, chalice bearers and acolytes; the sexton and facilities staff who maintain the church and grounds; the office staff who answer calls and set appointments; the congregation who offers prayers for your wedding and the use of the church; and the Wedding Coordinator who brings together all these gifts and talents.